OK, this is my new favorite show! Has anyone else seen it? It's a BBC production but PBS has started airing it. It premiered on PBS on September 30th. As Jenny comes to terms with her new life, we meet some phenomenal people who prove that their warmth, resilience and determination are to be admired beyond measure. At the heart of this world are the Sisters of St. Raymond Nonnatus who have been active in the East End as Anglican nursing nuns since the beginning of the 20th century. The Sisters and the midwives of Nonnatus House carry out many nursing duties across the community. However, with between 80 and 100 babies being born each month in Poplar alone, their primary work is to help bring safe childbirth to women in the area and to look after their countless newborns. 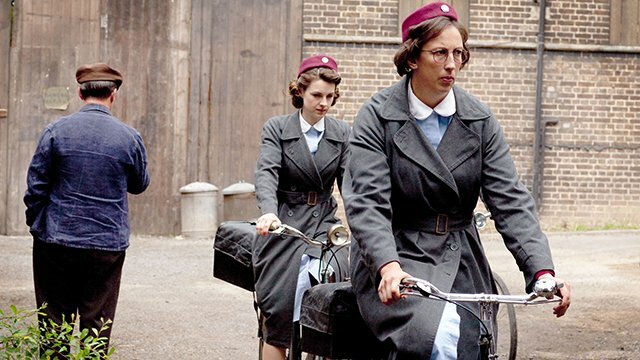 Starring newcomer Jessica Raine as Jenny, the cast includes Jenny Agutter, Pam Ferris, Miranda Hart and Judy Parfitt. Three other new faces, Helen George, Bryony Hannah and Laura Main complete the regular ensemble cast. Vanessa Redgrave provides the narration as the mature Jenny. I love this show. Granted they have only shown one episode here - episode 2 is tonight. 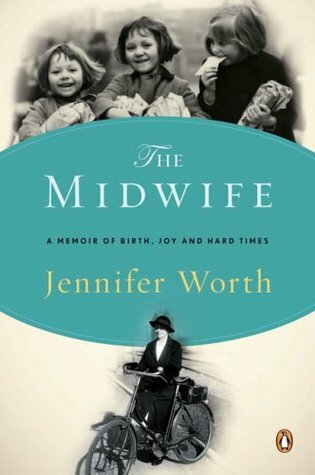 I think this was originally a BBC series, and is based on the memoirs of an actual midwife in London back in the 1950's. That breech birth was freaky!!!! I love that new midwife...the really tall girl. And how funny is that older nun who speaks her mind?! LOL! I keep thinking that old nun has the beginning stages of dementia or something. The young pregnant prostitute storyline was so depressing. The young pregnant prostitute storyline was so depressing. Did you see it last week when she kidnapped that couple's baby? Poor girl. She thought it was her "Kathleen". Last night's episode was interesting. That brother and sister. That's a great series. Can't wait for season 2. The tall girl (Miranda Hart) has a funny series of her own, mocking herself. Titled simply "Miranda". So was last night's episode it for this season?! It didn't show previews for next week; they just mentioned a "Christmas Special". Waaaa! I love this series. When she popped out triplets, I was sore! So glad 'tall one' didn't listen to her mama and married her man. Loved this show. Chummy FTW! I know! I was so glad she stood up to her mom. Loved the part where she let her mom know she wouldn't be wearing white on her wedding day! LOL! It’s 1958. Returning from a long day of duties, Nurse Jenny Lee finds the Nonnatus House community gathered to wish her a happy birthday, before she, Chummy, Trixie and Cynthia head off to the cinema — a joyous celebration. However, the Jenny's good cheer is short-lived when the next day she’s assigned a new patient, Molly Brignall. Molly’s due date is imminent and Jenny worries about the harm that could come to Molly and her children. Meanwhile, Trixie and Sister Evangelina find themselves aboard a Swedish cargo ship looking after the captain’s daughter, who is about to have her first baby. In a scene from Season 2 Episode 1, Jenny Lee and Chummy navigate their way around Poplar. pregnant daughter, Kirsten (played by Zandra Andersson). Another series on my instant queue that hasn't been tried yet. When am I going to find the time to test all these shows! Yay for season two! I dn't know why, but I thought there was one season and that was it. I cannot wait to watch. The book is good too! The author, Jennifer Worth, is who the character Jenny Lee is based on. I remember this. I caught it on TV in the maternity hospital. Not the best thing to watch under the circumstances. I kept watching because due to the time slot I thought it was Downton Abbey. Scary stuff.